Which Condos in Metro Manila Have Doubled Their Prices Since Launch? If you had bought a condominium from ArthaLand’s Arya Residences in Bonifacio Global City (BGC) when it launched in 2009, its value would have increased by 165 percent in 2017. That’s according to data from real estate analyst Leechiu Property Consultants (LPC), which listed Arya Residences and seven other properties as examples of the large price growth experienced by high-end residential condominiums around Metro Manila. “Sustained demand and limited supply of high-end condominiums in Makati City and Bonifacio Global City have pushed prices to an all-time high,” wrote LPC. It added that peak condo prices in BGC reached Php303,000 per square meter last year, while high-end Makati condos cost as much as Php295,000 per square meter. 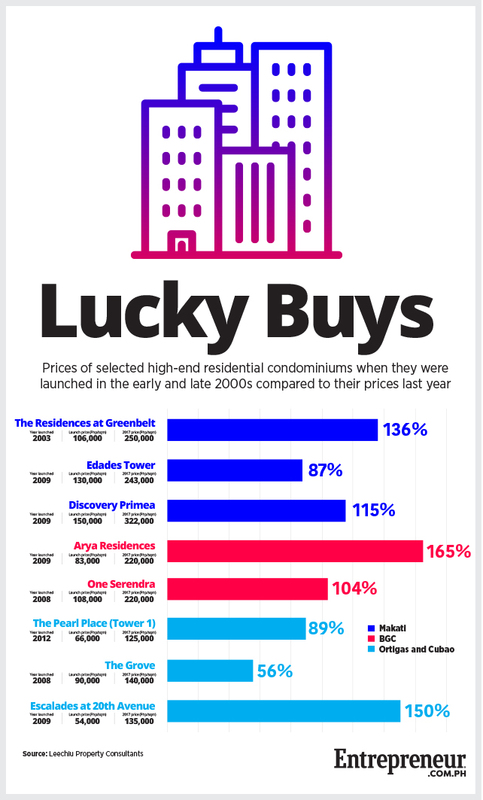 Indeed, LPC listed four examples of condos that more than doubled in price since their respective launches. Ayala Land’s The Residences at Greenbelt and JTKC Land’s Discovery Primea, both of which are in Makati’s central business district, saw their prices increase by 136 percent and 115 percent respectively since their respective launches. Aside from Arya Residences, Ayala Land’s One Serendra in BGC also saw a 104-percent growth from its launch price. But the surge in condo price wasn’t exclusive to the Makati and BGC areas, as LPC also listed examples from the Ortigas Center and Cubao areas that experienced similar price growth. The Escalades at 20th Avenue project by Robinsons Land in Cubao, for example, experienced a 150-percent price growth since launching in 2009, surpassing every condo in the list in terms of growth rate apart from Arya Residences.